By the middle of the last century Izhevsk had become one of the largest industrial centres of the Urals region. During World War II, Izhevsk was a major supplier of small arms. Mikhail Kalashnikov, the designer of the famous assault rifle, a living legend, lives and works in Izhevsk, he is its honorary citizen. Originally, Izhevsk's indusrty aimed at defence needs. The largest local industrial companies are: Izhmash (produces automobiles and motorcycles, machine tools), Izhstal (produces high quality steel), Mechanical Plant (produces hunting and sport riffles), Oil Equipment Factory (produces equipment for the oil industry), Radiozavod - a radio producer, Motozavod (produces communication sistems). Radical market reforms have caused serious economic difficulties for all these enterprises. Trade, restaurant business and services are now almost wholly owned by the private sector. Izhevsk has a high intellectual potential. There are research institutes of the Russian Academy of Sciences, two Universities, Agricultural and Medical Academies. 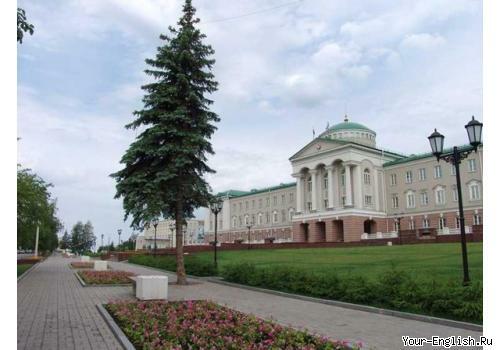 Being the capital of Udmurtia, Izhevsk is also a big cultural centre. There are four theatres, many cinemas, sport facilities. If a visitor comes to Izhevsk for the first time, he is always advised to visit the Museum of Local Lore, where he may learn a lot about the history of Udmurtia and Izhevsk. There are some buildings in Izhevsk which are really interesting from the point of view of architecture. Our Theatre of Opera and Ballet is a very peculiar building and many visitors find it highly original. We are also proud of the Izhevsk pond embankment, it's a nice place for taking a long walk. It was impossible for a foreigner to visit our city just a few years ago. Now, thanks to the development democratic tendencies in Russia, Izhevsk is open to everybody!